World renowned DJ Chubb Rock was interviewed on the Tom Joyner Morning Show to promote Tom Joyner’s Take a Loved One to the Doctor Basement Party and reveled his wake up call from friends like Heavy D dying and his recent diagnosis of Type 2 Diabetes. The “Chubbster”is going to be a part Doctor day! 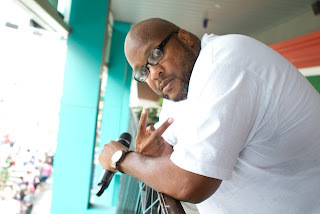 Thanks a lot Chubb Rock! It comes at a time for me that’s real crazy. I’ve had a few friends that unfortunately passed away, you know my good friend Heavy D, and I said man it’s time for me to cut down some of this weight. I’m over 40 and I went and I lost 45 pounds. But ain’t it a funny thing I go to the doctor and they hit me, this was just about 2 weeks ago now, and they hit me with the type 2 diabetes thing! I was like I lost 45 pounds and you hit me with this! You know it’s one of those things it takes time for it to do it’s damage and it’s very important; had I gone to the doctor, you know men don’t like to go to the doctor and coming from that West Indian background the doctor is a voodoo name, if I would have just kept up with it better I could have maybe seen some of the warning signs and maybe this wouldn’t have happened. Like I told a good friend of mine, my girl MC Lyte, when I told her what happened ‘I said I’m on my diet already I’m still on the diet, I’m feeling better and I’m gonna reverse this you know’… and then all of a sudden you guys come with the honor of trying to do this thing so I think it’s very important to take that family member to the doctor.